Katie and I had a lovely Saturday morning shopping trip, yes we are lame, and came across these wonderful things. I put a box in my cart immediately. Now Katie wishes she would have because we got our families together on Saturday night and I brewed one of these.....simply amazing! 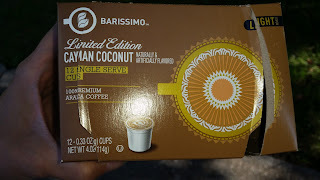 If you like coconut at all, you should try these bad boys! Also for a fraction of the price of other individual serving size coffee pods. I paid $4.79 for 12 cups, roughly 40 cents per cup....BARGAIN!